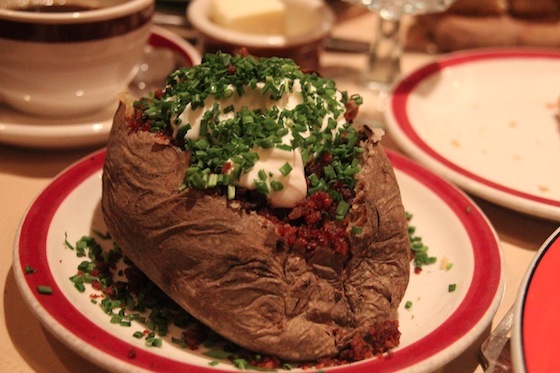 The House of Prime Rib is a San Francisco institution. They’ve been serving their supreme cuts of rib roast, baked potatoes the size of small footballs, and delicious creamed spinach with bacon since they were established in 1949. 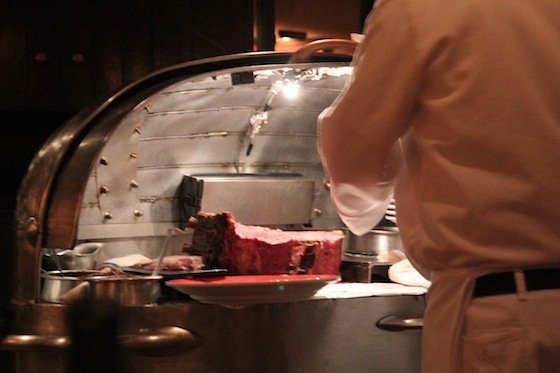 Even famous figure skater (and local) Brian Boitano named HOPR the best prime rib he’s ever eaten, and has childhood memories of dining there with his parents, who even went on dates there together before they were married. So as a native San Franciscan, I was shocked and appalled to realize I had actually never been there. I thought I had. I swore I had. But while watching an episode of Anthony Bourdain‘s No Reservations, I realized I didn’t recognize the interior of the restaurant. Nick and I even had several conversations where I tried to convince him I had gone there – and he was with me on two different occasions! “You mean Ruth’s Chris?” he said. No way! 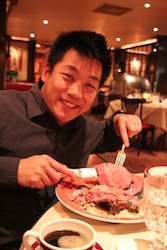 There was NO WAY I had never been to House of Prime Rib. But I was wrong. And as shocked and appalled as I was, I also realized, this was actually kind of awesome. I’d finally get to go! It was Wayne’s last night in SF for the weekend, so we decided we should take him to a special dinner. 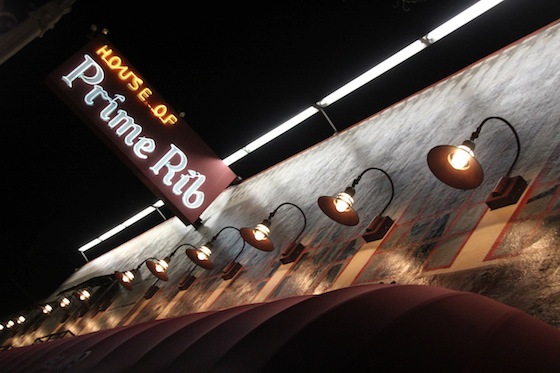 What place more epic, more San Francisco, than the House of Prime Rib? 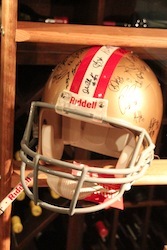 Even the famous Blue Angels and of course, the San Francisco 49ers have left tokens of their appreciation here! The City Cut: A smaller cut for the lighter appetite. 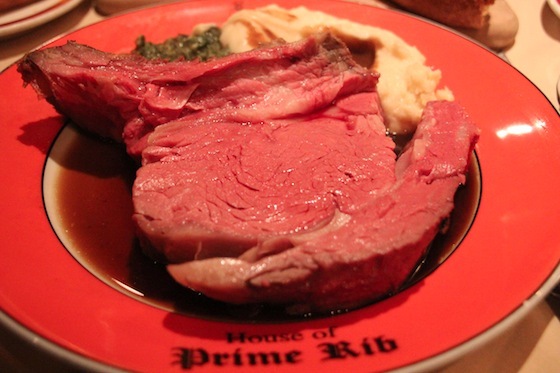 House of Prime Rib Cut: A hearty portion of juicy, tender beef. The English Cut: Some feel that a thinner slice produces the better flavor. King Henry VIII Cut: Extra-generous, thick cut of prime beef, for king size appetites. Fresh fish: Ask your server for today’s special catch and price. So all you have to do basically, is choose your cut (and what type of potatoes you want), and you’re good to go. The price difference between the cuts is minimal, so there wasn’t much agonizing over which one to choose. We all went for the King Henry VIII cut. Go big or go home. This majestically ginormous cut is just the way one should enjoy Prime Rib. It’s also the only cut to include the bone. Plus, if you’re able to finish your King Henry slab, they’ll offer you another small slice on the house. 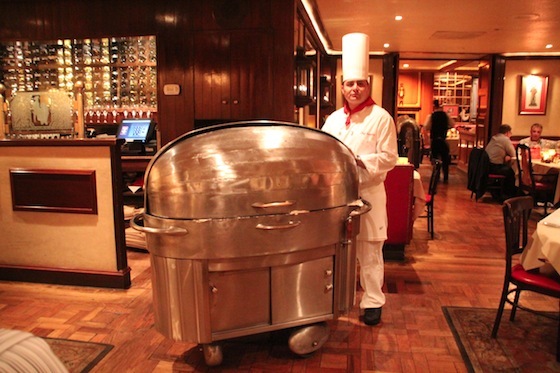 No one ever leaves hungry at The House of Prime Rib. Even though we were in a whirlwind of meat magnificence, Nick actually managed to get to that second slice after finishing his King cut. That’s my husband. 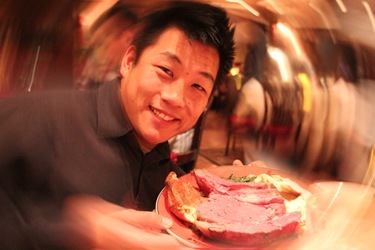 House of Prime rib serves fantastic food. It’s definitely the place to bring someone visiting San Francisco – that is if they like juicy, tender, dry-aged, salt-packed, then slow-roasted meat. Because that is what they serve here, and plenty of it. 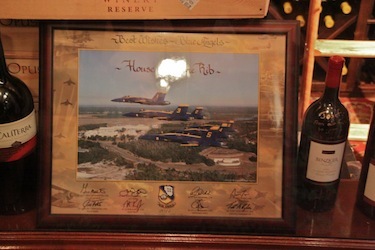 The staff is friendly and attentive, and the wine list isn’t bad. I also appreciate that they offer sparkling or still water at no charge (yes, I love my bubbles)! I’m anxious to find another person who hasn’t been there so we have an excuse to bring them. Have you been? We’ll take you!